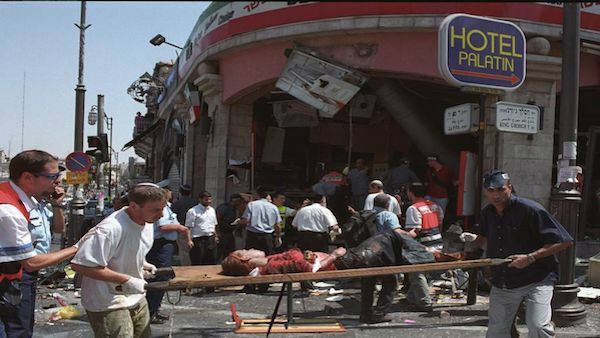 Sixteen years ago Palestinian terrorists blew up a pizza place in the heart of Jerusalem killing 15 people including 7 children and a pregnant woman, and 130 wounded. A month later, other Islamist terrorists blew up the World Trade Centers in NY, the Pentagon Building in Washington DC, and were foiled in their attempt to destroy the Capital building by the brave passengers of Flight 93. It is important to remember these acts, not simply to memorialize the innocent victims whose only crime was to be at the wrong place at the wrong time, but as a reminder that even sixteen years later, terrorism is still suckling at the teat of political correctness and Western World appeasement. Waiting on-line, when they brought me the baked Ziti I asked for, it was cold. So I asked the woman behind the counter if she’d mind warming it up. “Ein Ba’ayah”, no problem, she said with a smile. I will always wonder if that was her last smile on earth… A couple of moments later, a fellow from behind the counter came to the back with my baked Zitti. Then he started to speak to someone at one of the tables… That baked Ziti saved his life. At about 2PM, I both felt & heard a tremendous explosion, and day turned into night. And then the screaming began. An awful, heartrending sound; the sound of people coming to terms with a whole new reality, of people not wanting to comprehend that life has changed forever. Those of us sitting in the back were spared, but I was afraid of panic, so I started yelling at everyone to quieten down; not to panic. The ceiling looked like it might cave in, but there is always the danger of a second explosion, detonated on purpose shortly after the first… But then I smelled smoke, and was suddenly afraid the restaurant might be on fire. So we started climbing our way through the wreckage to the front. Terrorist Ahlam Tamimi helped to plan the Sbarro attacked and drove the murder to the pizza shop in Jerusalem in August 2001. On the day of the massacre (9th August 2001), she personally transported the bomb (10 kg) from a West Bank town into Jerusalem, concealed inside a guitar case. Taxi cabs brought her and an accomplice by the name of Al Masri, a young, newly religious fanatic, to an Israeli security checkpoint and from there into Jerusalem. To reduce suspicion, they dressed as Israelis and the bomb was not detected. Tamimi, who inspired, planned and engineered the Sbarro attack, personally led her “weapon” – Al Masri – to the target she had carefully selected. The Sbarro pizza restaurant, because it was located in the heart of Jerusalem and on a hot summer vacation afternoon it would be teeming with women and children. Tamimi instructed Al Masri to wait 15 minutes before detonating the explosives to give her sufficient time to flee the scene safely. He followed her orders. As to this being (as some journalists have implied) an act of momentary madness or lack of sound thinking, take into account that a short time prior to Sbarro attack Tamimi carried out a ‘dry run’, placing an explosive inside a downtown Jerusalem supermarket (Hamashbir Lazarchan) which exploded causing damage but resulting in no injuries. After the blast, bodies lay sprawled on the ground. Many of the wounded, huge nails embedded in their skin, were covered in blood and their clothes had been blown off by the force of the explosion. Ahlam Tamimi was captured, jailed for the murders, but released from an Israeli jail in 2011 as part the prisoner exchange for the kidnapped Israeli, Gilad Shalit. To this day she has shown no remorse for her mass-murder. Today she lives in Jordan with a TV show on the Hamas TV network. The primary blame for this massacre goes to the terrorists that planned and executed this massacre, Hamas the terrorist group the bombers were associated with, and Fatah the ruling party of the Palestinians which still celebrates the murderers as heroes. But there is blame to go much further than that. Before and after that horrible day in Jerusalem, radical Islamist terrorism has been suckling at the teat of the appeasers who run most of the western world, who believe it’s possible for murderous terror organizations to have a separation between their military and political wings, make deals with terrorist funding countries such as Iran, and support terrorist supporting organizations such as the Palestinian Authority to have a seat at the United Nations table. When Yassir Arafat started on his murderous rampage in 1964 (three years before the 6-day war), he was treated like the animal he was. Then slowly through a combination of Arab Oil power and the world’s continued hatred of Jews, the murderous rampage he began was treated with appeasement. Thanks to that appeasement the radical Islamic world was taught that terrorism is a legitimate means of political expression. That appeasement directly led to 9/11/01, al Qaeda, ISIS, and every other Islamic terror organization in the world today. The Sbarro bombing was not the first of these horrible murders or the deadliest. A little over a month later another terrorist attack, this time in the United States captured the world’s attention and drove the United States to become actively involved in the war against terror. And 9/11, for the first time in its history a US president treated a terror attack in Israel the same as any other act of war against civil society (at least until the Republicans lost Congress in 2006 and things began to revert). After election day 2008 under the leadership of new President Barack Obama the US reverted back to the pre-9/11 US mentality and began to blame Israel the victim for terrorist attacks in the holy land. Even worse this country stopped fighting a war to wipe out the fanatical Islamists. Sixteen years after Sbarro, and almost 15 years after 9/11/11, thanks to a President who believed in leading from behind, the Islamists had the United States on the run. The horrible Sbarro bombing was part of the second intifada which was waged to prevent peace: Israel and the Palestinians had been close to a peace deal where Arafat would get almost everything he asked for, but neither the terrorist or his people were ready for peace so Arafat walked away from the talks and authorized a wave of horrible homicide bombings. Everyone including former President Bubba Clinton said that Yassir Arafat walked away from a “sweetheart” deal. Note: Prime Minister Comb-over Ehud Olmert offered a similar deal to the PA’s President Abbas who never replied to the offer. That is why all peace talks fail, the Palestinian Authority and President Abbas do not have the courage or the desire to make peace. They claim to the world they are looking to make peace with their Israeli neighbors in English and say the opposite in Arabic. The truth that no one will admit is that moderates do not run the PA, it is the radicals who still run Fatah, its ruling party. Last summer Abbas ghoulishly celebrated the fact that his Fatah party killed its 11,000th innocent Israeli. The PA has done nothing has been done to prepare its people for a compromise peace and two-state solution alongside Israel. In fact, Jews and Israel are demonized and terrorists are honored. In schools, children are taught that the anti-Semitic Protocols of the Elders of Zion is true they regularly teach both children and adults to hate the Jewish people, and the Palestinian Authority spends 50% of its foreign aid on paying salaries to people who have committed an act of terrorism, and their families. For the eight years of the Obama administration, Palestinian violence was encouraged by a president doing all he could to force Israel to make one-sided concessions to the supposed “moderates” in Fatah, despite their refusal to recognize Israel as a Jewish State, and continued the killing of innocent Israeli. Via both of his secretary of states, Hillary Clinton, and John Kerry, Obama pushed peace with President Abbas’ Fatah Party, even though it didn’t want peace, and idolized & paid mass-murderers like the one who blew up a Sbarros pizza place in Jerusalem, as heroes. Thankfully America has a new President, Donald Trump who believes that America should lead the world in an effort to destroy the terrorist menace everywhere in the world (including Israel). He also fights for the incitement of terrorism anywhere in the world to be stopped.